This is a recipe that my aunt sent me recently. She said she found it in a mystery book she was reading and had made it. She had made it for dinner (the only thing) and I decided that I could do the same thing. The recipe is outline below along with the steps. After that, I’ve provided what I did/didn’t do. Toast bread in a 325 degree oven until dry. Cook bacon until crispy; remove with a slotted spoon. Pour off all but a couple of tablespoons of bacon grease. Add butter, onion, celery, apple, and herbs. Cook until soft. Add dried bread, bacon and broth and mix well. Bake in a casserole dish at 325 degrees for one hour. Okay, here is how I did this which is based a lot on how my aunt told me she did it. Following my aunt’s suggestion, I cubed the bread and put it in the oven to toast while I did the rest of it. I put it in as the oven was pre-heating to 325 degrees. By the time I was ready for it about a half hour had gone by. It worked pretty well. Oh, and for what it’s worth, I used a sourdough boule (a rounded loaf). I used my large dutch oven to cook everything, feeling that it was big enough to hold everything and was tall enough to keep the bacon grease splatters down. Once the bacon was done I took it out and poured all the grease out and then added back in about two tablespoons. I don’t know if that was the right amount but it fits the definition of “a couple” in the directions. My aunt said she used about 3/4 cup of onion. I used two that I had (turns out the last two I had) which probably worked out to be around a cup of onion. I didn’t measure it. My aunt did not use the apple but I did. However, I did not peel it. I was trying to save a little time. Plus, I chopped it into pretty small pieces and felt that cooking it and baking it for an hour would soften the peel and it wouldn’t be noticeable. I think it worked. Once I added the broth and bread I mixed it very well. I was trying to make sure that all the bread was coated with the broth and I didn’t have a bunch of dried bread pieces. Granted I understand that I just spent time drying the bread but still. I poured it into a greased, oval, 2 1/2 quart casserole dish for baking. Initially I was going to just bake it in the dutch oven I had cooked everything in but I was concerned about it sticking. While it was “coated” during the cooking process I already had stuff sticking to the bottom and didn’t want a bigger mess. It was almost too big for the dish I used but it was able to get it to fish and then it cooked down a bit more while baking. Based on schedules, this sat for about 20-30 minutes in the dish before I took any out. I don’t know if it needs to sit but it didn’t cause any problems. This was a very good dish. I did not have my youngest try it (the only one who was home). Normally I might have but it seemed like something she might not like (despite the bacon). I know my wife wouldn’t like it as she doesn’t “do” stuffing. Which is one of the reasons I made it when I did (her being out of town). 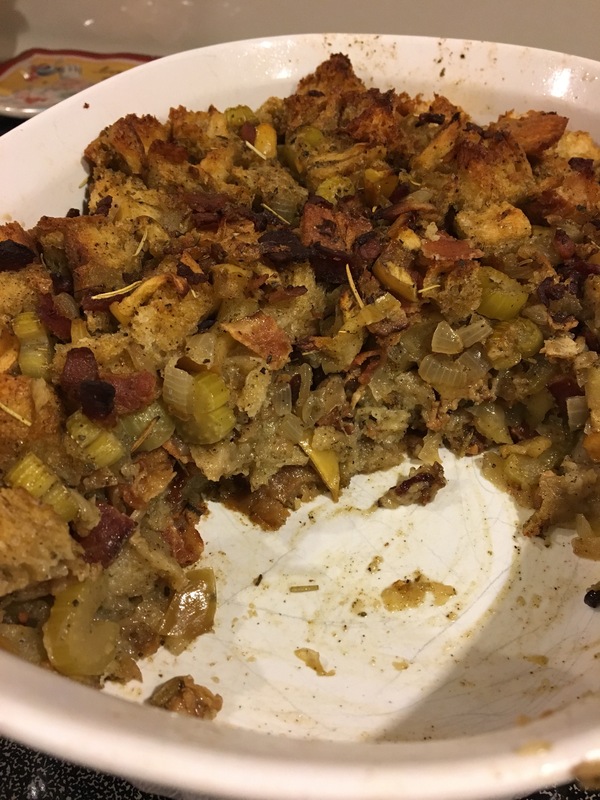 This entry was posted in Bacon, Casserole, Side Dishes and tagged apple, bacon, bread, crusty bread, sage, sourdough, stuffing, thyme. Bookmark the permalink.